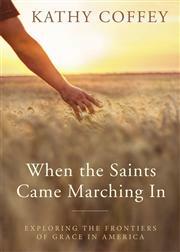 Editor’s note: Kathy Coffey’s latest book, When the Saints Came Marching In: Exploring the Frontiers of Grace in America was recently published. Below is a review of the book by John F. Kane, Emeritus Professor of Religious Studies at Regis University. Visit the Liturgical Press Website to preview the book and to find out more info about how to order it. This entry was posted in Books, Family Spirituality, Media and Reviews, Resources for Retreats for Catechists, Parents, and RCIA, Retreats, Speaking Topics and tagged Catholic saints, Elizabeth Ann Setor, John Neumann, Julia Greeley, Junipero Serra, Pierre Toussaint, When the Saints Came Marching In. Bookmark the permalink.